In the current Milan Furniture fair, a group of designers and scientists presented a stunning example of Biophotovoltaic - a moss table that generates electricity Through Photosynthesis. Photosynthesis is a process by which plants and algae convert carbon dioxide from the atmosphere into organic compounds using energy from sunlight. The plants use these organic compounds (like carbohydrates, proteins and lipids) to grow. When the moss photosynthesises it releases some of these organic compounds into the soil, which contains bacteria. The bacteria break down these organic compounds, which they need to survive, liberating by-products that include electrons. These electrons are captured by conductive fibres inside the Moss Table and put to use. In this way the devices harness energy which would otherwise be wasted. This is achieved using an array of 112 ‘moss pots’, which are bio-electrochemical devices. This means that they convert chemical energy into electrical energy using biological material. So what does this table do? At present, not too much. BPV technology is at an early stage of development and there are significant technical hurdles to overcome before products like the table are commercially viable. For now the table can power small devices like a digital clock. However, scientists anticipate that future devices may be able to generate up to 3W/m2. Low-energy consumption laptops are being developed which could operate at as little as 1W, meaning that a plant-powered laptop could be possible in the future. 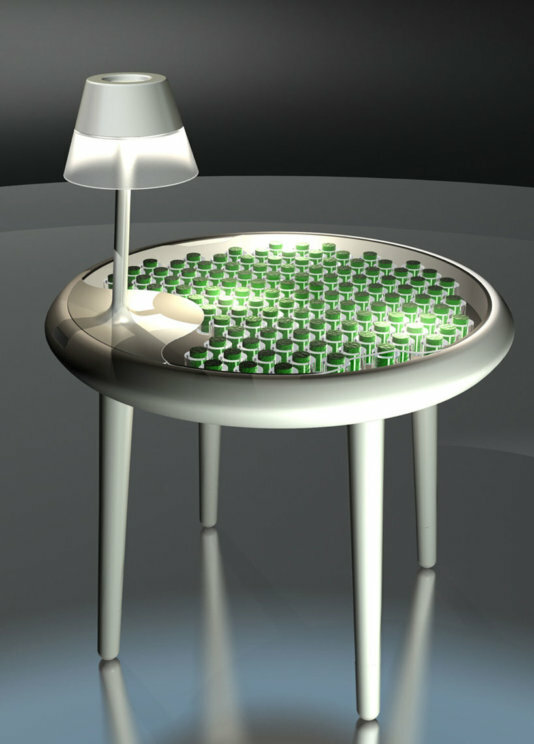 In this futuristic scenario, the Moss Table could power a laptop for over 14 hours. While still a lot of work lay ahead, this table might be the future of furniture.